This thick, free-form stone of natural, untreated Turquoise Mountain turquoise from Arizona was cut for us by master lapidary Conrad Armijo. This stone was mined well over a decade ago, but only recently cut from the rough rock. 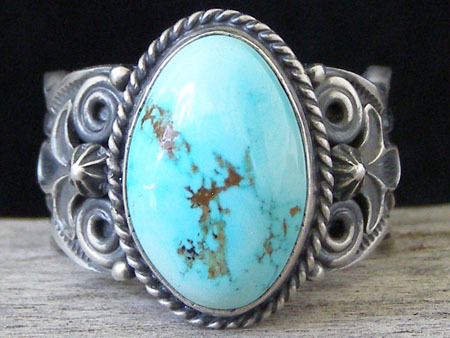 This thick stone is set in a 3/16" straight-edged bezel wrapped with twist wire. The hefty 12-gauge Sterling shank has scallop cut edges and is deep-stamped with classic motifs. Appliquées, starred buttons, scrollwork and tiny raindrops frame the stone to left and right. Ring face: 7/8" x 5/8"